shop-arrow-direct has no other items for sale. 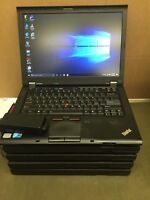 Lenovo ThinkPad Helix 11.6" Core i5-3427U 1.8GHz 180GB SSD 4GB - NICE TABLET! Sales tax may apply when shipping to: AZ*(7.1%), CA*(8.25%), CO*(2.9%), CT*(6.35%), DC*(6.0%), FL*(6.0%), GA*(6.0%), IL*(6.25%), IA*, KS*(7.8%), KY*(6.0%), MD*(6.0%), MA*(6.25%), MI*(6.0%), MN*, NV*(6.85%), NJ*(7.0%), NY*(6.0%), NC*(4.75%), OH*(6.25%), PA*(6.0%), RI*(7.0%), TN*(7.0%), TX*(7.25%), VA*(5.0%), WA*, WI*(5.0%). Your purchase is backed by our hassle free money back satisfaction guarantee. If for any reason you are not completely satisfied with your purchase within the initial 30 days from your order date, you may return the item for a prompt refund or exchange provided it is returned complete with all original accessories and packaged properly.